Local personalities Pabi Moloi, Zonke, Kabelo and Sizwe will be among the hosts at the glittering awards ceremony for the 18th Annual MTN South African Music Awards, the organisers announced this week. The four will be among nine celebrity hosts on the night, with further details to be revealed in the run-up to the main awards, taking place at Sun City on Monday, 30 April 2012. As the presenter of magazine show All Access, actress in programmes such as Soul City, and DJ on radio stations such as YFM and Metro FM and, more recently, 94.7 Highveld Stereo, Pabi Moloi is a style icon who has endeared herself to a multi-generational and multicultural audience. She is a previous presenter of the MTN SAMAs, in 2005. Eastern Cape lass Zonke hails from a musical family – her father was a drummer and her late stepmother, Anneline Malebo, sang in Joy (of Paradise Road fame). True to her roots, this talented singer-songwriter’s styles range from Afro-soul and house to folk and R&B, and she has worked locally and internationally with the likes of Oskido, Frank Roger, Loyiso and Mafikizolo. Kabelo Mabalane (aka Bouga Luv) burst on to the music scene as a member of superstar kwaito trio Tkzee, and has since carved out a successful solo career. He has scooped several industry awards, including MTN SAMAs, and has opened for international superstars such as Jay-Z. Among the recent feathers in this singer-songwriter’s cap is the SHOUT anti-crime campaign that he co-founded with Danny K.
Sizwe Dhlomo, YFM presenter and former co-host of SABC1’s Live, is also no stranger to the MTN SAMAs, having served as a digital presenter at the awards two years ago. Sizwe shot to fame after winning the first-ever MTV Base VJ hunt in 2005. He has continued to woo viewers and listeners with his verbal agility and winning manner when interviewing stars such as Akon and John Legend. Catch these four celebs – as well another five sizzling hosts, and a constellation of star performers – at the 18th Annual MTN South African Music Awards, which will groove their way into Sun City on 29 and 30 April 2012. The main awards ceremony, on Monday 30 April, will be televised live on SABC1 from 8.30pm and will be streamed live via the website (www.samusicawards.co.za), the mobisite (www.mtnsamatv.mobi) and the MTN SAMA Facebook page (www.facebook.com/samusicawards). Swazi Dlamini, Jen Su, Heinz Winckler and Unathi have come on board to host the 18th Annual MTN South African Music Awards at Sun City, joining Kabelo, Pabi Moloi, Zonke and Sizwe to present the sought-after trophies to SA music’s finest. These eight celebrity hosts will be joined by one more “mystery host”, who will be revealed on the night of the main awards ceremony, Monday, 30 April 2012. The event may be taking place at Sun City, but the mercury is set to be eclipsed by the stars that will be strutting their funky stuff down the MTN yellow carpet on the night – from the performers and nominees to the presenters and hosts. SAMA- and Kora-winning musician and businesswoman Swazi Dlamini, who is married to fellow musician Tshepo Mngoma, has demonstrated her versatility in experimenting with new sounds and different languages over the years. As a singer she continues to dazzle across genres, from jazz and gospel to blues and R&B. American-born television and radio presenter Jen Su gained prominence as a financial news anchor for Sky News via its South African affiliate, Summit TV. This super-stylish media personality also presents The Hollywood Report on 5FM with Gareth Cliff as well as entertainment news for SABC3 breakfast show Expresso, and is a talented singer and musician. Pop/rock singer Heinz Winckler won the inaugural series of Idols in South Africa, and was placed fourth on World Idol in 2003. This SAMA nominee has notched up gold and platinum records, with Walt Disney using one of his songs for the movie Treasure Planet. He performed in the North American touring production of Rent and supported Westlife on their 2005 South African tour. The sublime Unathi Msengana is a multi award-winning singer, actress and radio personality who, in 2011, further endeared herself to millions of TV viewers during her first season as a judge on M-Net’s Idols. Unathi co-hosts a show on Metro FM with Glen Lewis, and she is married to fellow DJ Thomas Msengana, aka Bad Boy T, with whom she has two children. 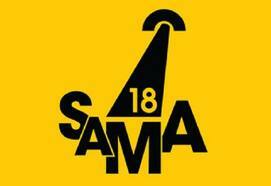 Catch all the MTN SAMA 18 excitement live on SABC1 from 8.30pm on Monday, 30 April. You can also watch the live-streaming of the ceremony via the website (www.samusicawards.co.za), the mobisite (www.mtnsamatv.mobi) and the MTN SAMA Facebook page (www.facebook.com/samusicawards). Media Release Issued By Speakers Corner|Approved Editor / leave your comments for me below the comment box or send them via email to editor@goxtranews.com.